Kitchen floors always pose a challenge. Do we continue the not-always-practical hardwoods throughout or do we interrupt the flow with a more indestructible surface alternative? 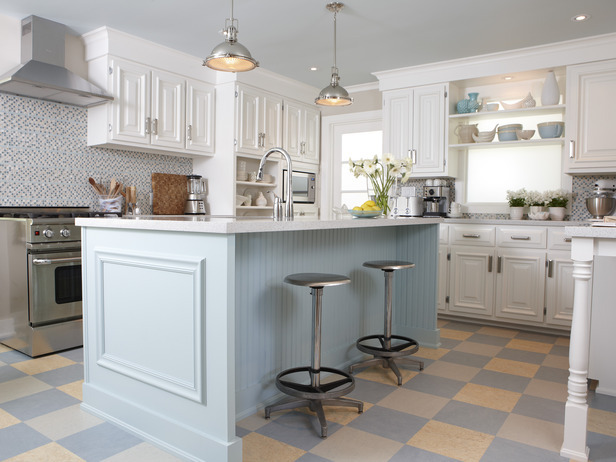 In this kitchen by Designer Sarah Richardson, she used a linoleum tile to create a colorful and durable floor to complement the light pastel blue and white palette. What we do not see is the adjoining room and how the two areas are connected. If you have a small house, continue the hardwood floors throughout the downstairs public areas (living room, dining room, family room if there is one, and kitchen). That way, the house will appear larger and less chopped up into individual rooms. If you have an old house (or a large one) with distinct room divisions, go ahead and select an alternative flooring that offers color or durability (although carrying the hardwood throughout is okay too). I recommend using the color palette to pull the public areas together so in Sarah’s case, the adjoining room would have some light blue in it. Mixing and matching within the color palette will create the feeling of a larger, more pulled-together house — even if the rooms are boxy and divided by walls and small doors. Just like there are more options than granite and Formica for your kitchen counter top, there are now numerous exciting alternatives to wood and tile on your kitchen floor. I was wondering if you know where I might be able to find the linoleum flooring that Sarah Richardson used in the light blue kitchen above? I think that material and color combination are the perfect solution to a kitchen color problem in a home we are purchasing. Thanks so much for your blog. I love it! Sorry for the delay. I wish I knew what flooring Sarah used. Her website probably has more details. I love her style — it truly is fresh and contemporary but always with a welcoming country charm. Good luck with your kitchen! You are currently reading Not-So-New Kitchen Flooring Ideas at Your Home & Color Coach.